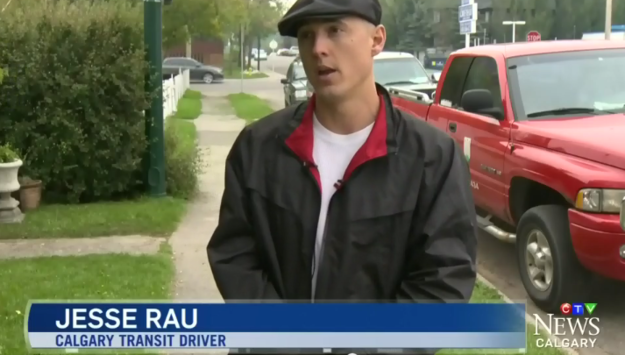 Fearing for his job, after having his facebook wall monitored by his employer, the Calgary Transit, Jesse Rau came out publicly in the media to plead for his right to abstain from promoting the homosexual parade, which goes directly against his Christian beliefs. “I was shocked when my supervisor called me in to chastise me about my personal facebook posts and to inform me that if I wanted to have a good career with the Calgary Transit, that I should stop posting my personal opinions on facebook. I never would have imagined that I was not free to express my personal opinions about the changes going on our society in my private time. Nor would I have imagined that my job would be on the line because of it. Then when my employer went against their own policy that states that no idealogies are to be promoted through their organization, and indicated that bus drivers would be expected to drive the “Pride Bus” and promote the homosexual parade, that’s when I decided to appeal to the public about what the City Transit is doing to its employees and so I took it to the media,” stated Rau. Unfortunately, Mr. Rau was right about his fears relating to his job. The Calgary Transit has now demonstrated that they do not respect their employees’ guaranteed fundamental freedoms. But rather that transit employees should fear being coerced by Calgary Transit through surveillance, and pressure relating to job loss, into embracing whatever they demand. Jesse Rau was fired after being grilled for five hours, during a special meeting, that felt to him more like an interrogation, being asked questions unrelated to work duties, but rather relating to his personal beliefs and even the opinions of other people who commented on his facebook wall. The City indicated that sharing his views and concerns in the media and on social networks is not permitted. It seems clear that if his views aligned to their position on homosexuality and particularly the “pride” event, that they would never have blinked let alone interrogated and fired him. We are raising awareness and are calling a press conference tomorrow (today, Friday Sept. 11) which will held outside at 1740 – 25a Street SW at 2:30 PM. For more information please call 403-607-4434 or e-mail art@streetchurch.ca. Everyone that wants to stand in solidarity with Jesse Rau and his family is welcome to join a special rally which will be held at City Hall on October 10, 2015 at 12:30 PM. Anyone interested in helping Jesse Rau with expenses related to job loss and hiring a lawyer can contact Jesse’s pastor Artur Pawlowski who will be working with Jesse on this issue (403-607-4434 or e-mail art@streetchurch.ca ). Alternatively people wanting to hand their financial support to Jesse personally can do so at the October rally. “I will leave you with this thought, yesterday they were coming for the politicians, judges, and doctors today they are coming for the bus drivers, clerks and bakers. Believe me, I grew up in a country like ours has become, and I can tell you tomorrow the communists/fascists/dictators are coming for you. Will you let them?” stated Jesse Rau’s pastor Artur Pawlowski.